Attend the Writer’s Police Academy in Jamestown, North Carolina from September 23-26. And get a cool T-shirt in the deal! In addition to the popular Firearms Simulation Training (FATS), this year’s event has added a driving simulator, and for a few lucky participants, ride-a-longs in police cruisers! Hi, I’m Sandra Orchard. Anita Mae invited me by to tell you about my awesome experience at last year’s academy. The event is held at an actual training facility and offers an incredible array of hands-on, interactive and educational experiences to enhance a writer’s understanding of all aspects of law enforcement and forensics. On opening day, almost every imaginable law enforcement and rescue vehicle assembled in the parking lot, and officers were on hand to answer our questions about the equipment. In addition to the sheriff and police command-post trucks pictured, there were motorcycles, cruisers, a fire engine, ambulance, bomb retrieval (that’s little R-2D-2 in the picture), dive team equipment, riot gear, and more weapons than an Arnold Schwarzenegger movie. 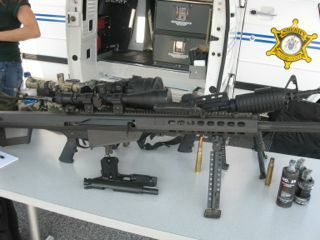 Nothing like handling the equipment, and talking to the officers who use it to add realism to your descriptions. 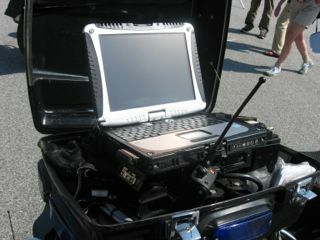 We could choose from a vast array of classes such as handcuffing techniques, fingerprinting, forensics, jail search, arson investigation, pepper spray demonstration—yes, one brave officer let himself be sprayed, crash investigation, tools of the trade, sprinkler demonstrations, the list goes on, and… my favorite, undercover work. Considering that I had just signed a contract for the first book in my “Undercover Cops” series with Love Inspired Suspense, I was anxious to glean all that I could from this class. Not only did Marco Conelli, former undercover cop turned writer, share many of his experiences, he gave us glimpses of what went on in his head and heart during that time, which is where the real meat of my heroes’ stories lie. We arrived at the academy not knowing what to expect. It was kept very hush, hush. We were divided into two groups and ushered into the school one group at a time and stationed in the hall. You need to understand that this is an actual college and students were in classes. Suddenly an armed gunman, wearing a conference ID tag just like the rest of us came charging down the hall. As you can see in the video it felt very realistic. 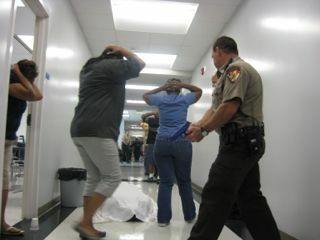 Within minutes police swarmed the hall, took down the gunman, waited for the paramedics to assess him as others secured the building. One officer kept his weapon trained on the downed gunman until the paramedics ran a strip and confirmed he was dead. Officers then escorted the hostages out of the school to be interrogated separately. You’ll notice in the picture that the hostages are escorted with their hands on their heads because they have no way of knowing if the gunman had an armed partner. 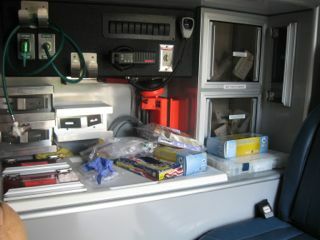 Then we observed the paramedics treating a bullet wound in one of the victims. 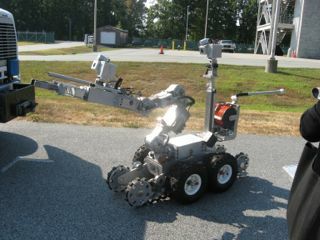 Afterward, we were told that we’d observed a “Rapid Deployment Demonstration “provided by local law enforcement & GTCC students. As a writer, being in the middle of it, hearing the shouts, gunshots, crying students, tasting the fear and panic and desperation, feeling the cloying atomosphere, I was able to absorb so much that I can now write into scenes in my novels. Fire Arms Simulation Training was an added bonus for attending the academy. 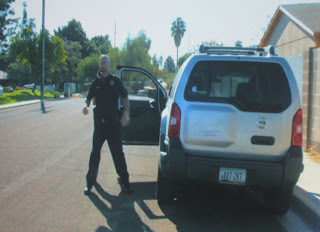 We were given Glocks (some had stun guns) and faced with a floor to ceiling screen that showed videos of shoot and don’t shoot situations like the one pictured above in which the driver jumped out of the car and grabbed the officer from behind. Obviously, I (the partner back in the cruiser) can barely see the suspect, let alone take him down. When we took a shot, the hit would show on the screen. We were surprised more than once by the post-simulation explanation of why we should have, or shouldn’t have, taken a shot. For example, in one depiction a man held a baby in a car seat and was wielding a knife yelling at us to stay back. We’re calmly telling him to drop the weapon, unwilling to shoot because the guy might drop the baby! He’s not listening so our shouts grow more urgent. I don’t recall if a single one of us took a shot, because of the danger to the baby. The officer conducting the training told us after the scenario that any officer unable to take that shot would be kicked out of the academy. The man was a serious threat to the life of the baby and the officers and was not responding to instructions. The most adrenaline-pumping moment for me was when I had to face a hostage taker alone in an office (as depicted on screen). A disgruntled employee had his boss in an arm lock and was waving a gun. I was telling him to put down the weapon, that he really didn’t want to do this etc. But to no avail. All the while, I trained my own weapon at the guy’s head—the only part of his body visible past the hostage. The instant he lifted his gun, I took the shot. I pretty much freaked out on him, saying I could have hit the hostage. I was shaking, heart pounding. It was unbelievable. It gave me a whole new perspective on the split second decisions officers are called upon to make and the emotional havoc it can wreak afterward. 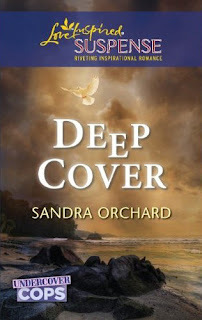 Sandra Orchard writes inspirational romantic suspense set along the northern shores of Lake Erie in the heart of the Niagara region, Canada. 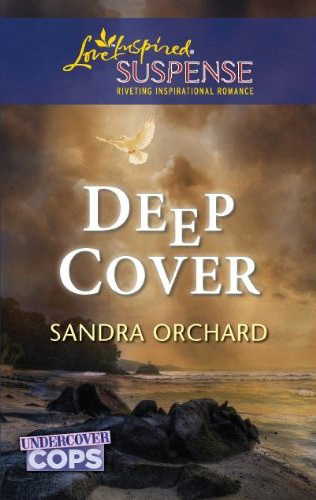 In 2009 she won Daphne DuMaurier Award of Excellence and sold to Harlequin’s Love Inspired Suspense the following year. 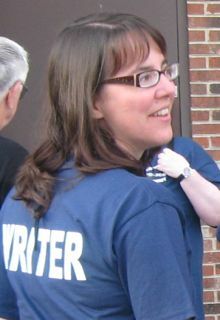 She is an active member of ACFW, several RWA chapters including Faith Hope Love, and The Word Guild. When not writing, she enjoys hanging out with family, especially her new grandbaby, brainstorming new stories with fellow writers, and hiking or kayaking in God’s beautiful creation. Her newly released debut novel, Deep Cover, is the first in her series, Undercover Cops: Fighting for justice puts their lives—and hearts—on the line. That is quite an experience. Great post Sandra and Anita Mae. Research can be so much fun. Brain matter? Whoa! No messing around there! OK, I'm jealous. I did get to attend an earlier version of Lee Lofland's Writers Police Academy, but when it was held in conjunction with another writers conference and not at this location. It sounds like they added so much! Looks like you had a great time, and looking forward to your book! Very cool. A suspense writer in my hometown, Christy Barritt, actually got to go to the CIA citizens academy. I think it lasted a few weeks. Not sure how she pulled that off. A lot of police departments do hold citizens' academies. I know a number of writers who've participated in those. Worth doing if you can swing it! Wow! This is incredible. Thank you Sandra, for sharing this. I would truly be interested in attending. Is this an annual event? Hi Suzie, this is its second year, but Lee said he wasn't sure if he'd keep doing it. It is a ton of work to coordinate. Welcome to the Inkwell, Sandra. Until we talked at last year's ACFW conf in Indy I didn't have a clue what this was about. Even after that the magnitude didn't sink in until I saw your photos and video. Thank you for posting with us and showing this fabulous resource. I wanted to mention to all the suspense writers in the group that you should read Lee Lofland's blog regularly. It's a wonderful resource for suspense writers. Barbara mentioned that he organizes this event, but I'm not sure I did. He's also the author of Police Procedure and Investigations, and a former cop. Thanks, Sandra, for writing about the WPA. It's such a wonderful opportunity for writers, and for others who simply want to learn about police, fire, EMS, and forensics. We're a bit different than a citizens academy because the WPA is designed with writers in mind and, nearly all the experts/presenters are writers, too! Barbara (Hi Barbara!) attended our first effort that was held in conjunction with the fabulous Mad Anthony Writers Conference in Hamilton, Ohio. That event was our test to see if should do a full-blown conference. Well, it's been a sellout each year since (this is our 3rd). The 2011 WPA is our largest yet. We even have a helicopter landing on the grounds. As usual, there'll be lots of shooting, biting dogs, actual fires to put out, explosions, and, as always, there'll be plenty of real-time action. The WPA is held at a real, working police, fire, and EMS academy, and their instructors teach writers the same information (this is a hands-on event) they teach the police recruits enrolled in their academy, which, by the way, will be in session this year during our event. So you'll be able to observe the recruits in action and see how it's really done. I know that on Friday, the fire academy will be clearing a burning building. Anyway, I do hope to see some of you there. And please do visit our website and my blog. If I can ever assist any of you in any way, please don't hesitate to contact me. By the way, you guys are in very good company (Sandra and Barbara). Wonderful folks. Thanks so much for stopping by Lee. The more I hear about what's new this year, the more I wish I could be there! I should say that the Mad Anthony was the first conference I ever attended, before I had completed my first WIP. And Lee gave me my first professional critique. And he had rave reviews. Okay, not-so-rave reviews. He actually told me that I had no conflict and that it put him to sleep! But that led to a full rewrite of the first chapter (after I stopped grousing) which later finaled in the Genesis. So I owe a lot to Lee. And his critiques of the police procedure on the ABC show Castle alone are worth a trip to his blog. Barbara - I'm a tough-love sort of editor/reviewer. What you're not mentioning, though, is the fact that I loved your voice and writing style. In fact, I kept a copy of those pages for the nights when I have trouble falling asleep... :) I'm kidding, I'm kidding! Seriously, I did enjoy your writing, a lot. You're very talented. ROFL, Lee!! Actually, I'm getting requests from agents and editors on a much edited (and hopefully more exciting) version. So I was being honest when I said I owe you a lot. And Sandra--do you live in the Niagara region of Ontario? Because I'm north of Buffalo. If so, we should get together. Wow, what an awesome experience! Thank you so much for sharing it with us, Sandra. Great photos, too (I couldn't see the video for some reason, but yahoo is giving me issues today). All the details you gleaned from the instruction and observations you experienced clearly make for a more realistic, compelling story. I'm placing your book on my TBR list! Thanks, Sandra and Anita. Hooray for Barb and her 'great reviewed'/book with no conflict novel. Because it's all about digging in, starting over and forging on! Sandra, did I miss any mention of the setting? (My brains is fuzzier than usual) Is Deep Cover set along the Niagara River? Hi Debra, Deep Cover and the entire Undercover Cops series is set in a fictional rural town Miller's Bay situated near the northern shores of Lake Erie in Niagara. Sandra, that sounds like so much fun! Well, I guess a good mix of work and play :) Wow, I wished they offered that kind of thing to just a regular crime show junkie like me, that would be awesome! I'll have to keep an eye out for your book. Laura - The WPA is open to everyone, not just writers. Lee, thanks for stopping in today and making yourself and your program known. Such an awesome experience.